The Sales Planning with Account Level Potential app allows you to calculate the potential sales by product from your customers and prospects and immediately leverage this information to improve your sales force effectiveness. The concept of Account Level Potential is underutilized, and therefore, those organizations that truly leverage this data have an edge against their competitors. The Sales Planning app uses a potentialization methodology based on defining industry and product based cohorts and using frontier analysis to come up with potential sales values for each of your accounts by product. Additionally, if you want to source your potential sales data externally, or use a more complex regression based potentialization methodology, these values can be directly overridden within the model in place of the standard calculation. Segments can be defined based on total company revenue, employee count, or total IT spend. After the initial segmentation process, the original designation for any account can be manually overridden where appropriate. With the final segmentation complete, you can now assess how your potential is distributed across all of your customer segments and possibly identify opportunities where potential is concentrated. With account level potential and coverage assumptions, you can estimate the required headcount for each of your regions. Using these values as a proxy, you can create a comparison against with your actual current deployment levels to highlight variances and subsequently adjust these deployment decisions in the model. 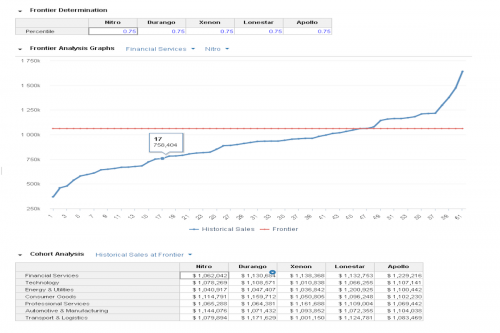 Territories can be balanced by creating an index based on measures of historical sales, workload, and potential. 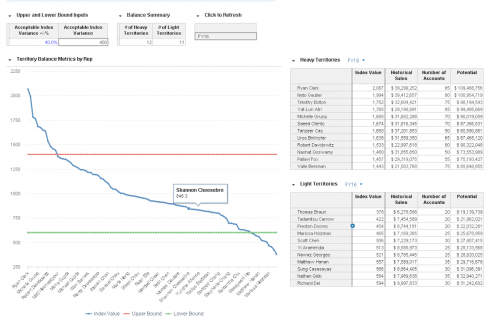 The Sales Planning app allows you to easily create this index, set weightings for each factor, isolate heavy and light territories, and address them by reassigning their accounts. A disruption report will summarize the impact of any changes that you make. 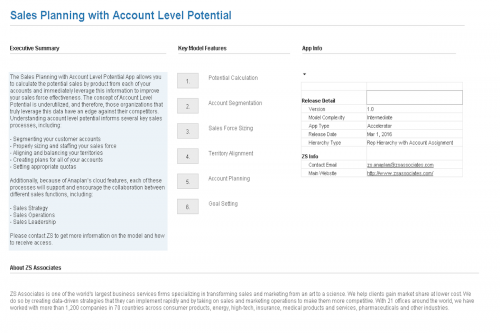 Account planning allows you to define your account level potential at a more granular level, indicating from a dollar perspective, how your potential is segmented between retention, increased share of wallet, cross-sell, and new customer acquisition. Additionally, your cross-sell potential can be specifically delineated by identifying which of your products have cross-sell potential with other products in your line. 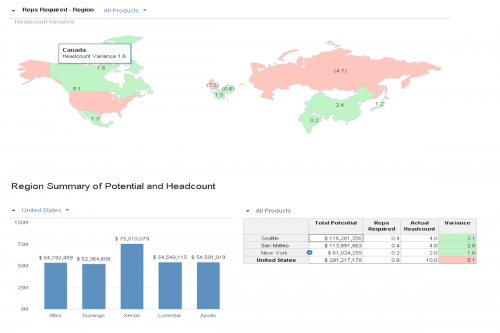 The Sales Planning app allows you to incorporate account level potential into the quota setting process, by allocating your organizational quota to each of your territories on the basis of historical sales and the amount of potential each territory covers. The weightings between historical sales and potential, used to determine the allocation, can be adjusted depending on the type of reps you are trying to incentivize.